Army Sgt. Kevin Hayes lay flat on his back in a circular operating room at Walter Reed Army Medical Center, his right eye pried open directly beneath a laser. "Acquired," a computer attached to the laser announced in a metallic voice, signaling that the machine was tracking Hayes's pupil. A motorized instrument sliced an opening in Hayes's cornea. Lt. Col. Scot Bower, an Army surgeon, pressed a foot pedal, triggering a laser that delivered pulses to reshape the cornea to Hayes's prescription. Within minutes, Hayes, 24, was recuperating in a waiting area, slightly dazed behind protective eyeshades but no worse for the wear. The Army is building itself a better soldier, one eye at a time. After years of skepticism, the military is embracing laser eye surgery with enthusiasm, envisioning soldiers in Afghanistan and other hot spots who no longer have to worry about glasses fogging up or contacts popping out during combat. "It makes people into potentially better soldiers, better able to perform their duties," said Bower, director of refractive surgery at Walter Reed, in Northwest Washington. "They're kind of tuned up, if you will," said Col. William P. Madigan Jr., assistant chief for ophthalmology at Walter Reed. Just two years ago, anyone who had undergone such surgery would have been disqualified from active duty. Now, laser eye surgery is not only allowed, but it is also actively promoted by the military. Today, Walter Reed is launching its Warfighter Refractive Eye Surgery Program. There and at other Army hospitals across the country, the surgeons expect to correct the vision of thousands of soldiers in coming years. The Air Force and Navy offer similar programs. "There's a huge demand for the procedure -- probably more demand than we're going to be able to handle," Bower said. The about-face came after a Department of Defense medical panel, after evaluating several years of research by the Navy, concluded that concerns about laser surgery damaging the structure of the eyes had not been borne out and that -- to the contrary -- the surgery was a way to improve the fighting forces. Congress subsequently approved $15 million for the program. Officials are quick to point out that the laser surgery is strictly voluntary. "It's not a program to build an Uebermensch," Madigan said. Nonetheless, many soldiers are encouraged by superiors to have the surgery. "Commanders are seeing the potential and wanting to have their troops treated," Bower said. "People are seeing it as combat readiness, enhancing the fighting force." Eyeglasses have long been troublesome for soldiers, and modern warfare has made the problem worse. Increasingly, the military is employing sophisticated weapons and gadgets where glasses can get in the way. Soldiers who wear glasses need prescription inserts to wear gas masks. The same is true of goggles being developed to protect soldiers from enemy lasers. "If your glasses steam up or fall off, you've become a liability," Madigan said. "You're no longer part of the solution -- you're part of the problem." In harsh environments where U.S. troops often are deployed, contact lenses can be even worse. Many soldiers who wore contact lenses during the Gulf War ended up ditching them and wearing glasses, Madigan said. 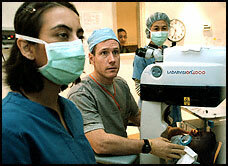 Laser eye surgery was approved by the Food and Drug Administration in 1995. Since then, more than 3 million Americans have had the surgery. Bower estimated that the surgery he performed on Hayes's eyes would cost $2,700 to $4,500 in the civilian world. The adverse effects reported by small percentages of patients -- including pain, glare, halos and vision left worse than it had been with glasses or contact lenses -- have not been common enough to stop performing the surgery, Army officials said. Much of the military's earlier concern involved LASIK (Laser Assisted In-Situ Keratomileusis) surgery, which Hayes underwent. There were worries that the flap created in the cornea as part of the procedure might tear open in combat conditions. As part of its review, the Army monitored how members of its elite combat force, the Rangers, fared in rugged training conditions after having the surgery. "They could jump out of planes at night, fight with pugil sticks, slog through the swamps for weeks and not have problems," Madigan said. "They reported that it gave them an edge. They didn't have to worry about fogging up their glasses or losing their [contact] lens." Added Col. William Rimm, chief of ophthalmology services at Walter Reed, "We were criticized for being slow on the uptake, but we wanted some science to back it up." The military remains reluctant about allowing LASIK surgery on aviators out of concern that high-speed ejections from aircraft could tear the flaps, officials said, and more research is being conducted. The Army has established criteria for who should get the surgery first, according to Madigan. Top priority will be given to infantry and Special Forces, followed by others deemed likely to face combat, including armor, artillery and combat engineers -- "The people actually mixing it up," Madigan said. Within a unit, commanders may decide the priority, Madigan said. The services estimate that 35 percent to 50 percent of service members need corrective lenses, but eligibility for laser surgery depends on the type of eye problem and other medical factors. Initially, officials predicted that perhaps 30 percent of eligible troops would opt for the procedure. But given its increasing popularity, the figure may be 70 percent to 80 percent, Rimm said. Soldiers go through counseling before the treatment, and if a doctor senses uneasiness, the surgery is canceled, Madigan said. "The soldier always has the last say," he said. Walter Reed's refractive surgery center has corrected the vision of nearly 200 service members since opening in January. Soldiers who have had the procedure have given it rave reviews. "Being a person who's worn glasses since second grade, it's been a kick," said Marine Master Sgt. Bob Beyer of Woodbridge. "It was 15 minutes, and I was out and seeing," said Spec. Antoine Flowers, assigned to a satellite control battalion at Fort Meade, while reporting for his one-week checkup. "This is the best thing since sliced bread. I can see." Flowers said that word of the surgery is spreading quickly at the Army post in Anne Arundel County. "I have four more people in my unit trying to get it," Flowers said. "Everybody's trying to get it."